The first photograph, a Dagguerreotype, was introduced in 1839, (Read "Living History" for a great Daguerreotype story) but, in the two decades that followed, photographic experimenters had energetically sought a less expensive and cumbersome way of capturing a photographic image. Almost simultaneously the Ambrotype and Tintype were born. The tintype process was first described by Adolphe-Alexandre Martin in France, in 1853, and patented in the United States on February 19, 1856 by Hamilton Smith, a professor at Kenyon College, in Ohio. First called Melainotype, and then Ferrotype (by a rival manufacturer of the iron plates used) the name Tintype eventually took prominence although all three names describe both the process and the resulting photograph equally. Where the Ambrotype process consists of pouring a light sensitive mixture of collodion (silver nitrate) over a small plate of glass, a Tintype is made by coating an iron plate (hence ferro) with the light sensitive collodion silver mixture. The backs of the tintype were lacquered to protect the exposed metal from rust and oxidation. A Tintype can easily be distinguished from other metallic photographs because the iron support of the Tintype will attract a magnet. This test is helpful if you are presented with a photograph under glass within a case. The copper in a Daguerreotype does not attract a magnet, an Ambrotype has a glass support and only the Tintype will attract the magnet. The Tintype's image is technically negative but, because of the black background, it appears as a positive. Since the Tintype itself was placed inside the camera and delivered as the final print, most Tintype images appear reversed (left to right) from reality. 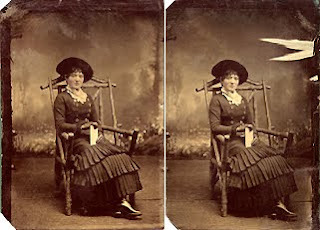 Some cameras were fitted with mirrors or a 45-degree prism to reverse, and thus correct, the image, while other photographers would photograph the reversed tintype to produce a properly oriented image. Many photographers, however, simply delivered the reversed photograph to the customer to save time and expense. Failure to recognize this possible reversal has led to many false assumptions. Many of my customers have been heard to say, "Look, Grandmother isn't wearing a wedding ring. This photograph must have been taken before she was married." On the contrary, with the photograph reversed, Grandmother certainly was wed with the important ring placed clearly on the left hand, but appearing reversed in this image. I have often had my attention drawn to articles written about the western outlaw, Billy the Kid, whose famous photograph of him holding the barrel of a rifle, by means of reversal, has many assuming that he is left-handed. Perhaps not. Unlike the singly created images of Ambrotypes, Tintypes were usually produced in multiples at a single sitting. A multiple lens camera, with up to twelve or sixteen lenses, was used to produce multiple images on a single plate for efficiency and easy distribution to family and friends. The metal used to support the Tintype image was actually iron and, according to one story, they came to be popularly known as Tintypes because of the tin shears used to separate the individual photographs. Tintypes came in full-plate, half-plate, quarter-plate, and one-sixth plate sizes. The most common size was approximately two and one-quarter by three and one-half inches. A photographer could prepare, expose, develop, and varnish a tintype plate of several photographs in a few minutes, quickly having them ready for delivery to a customer only a short while after taking the subject's picture. As a result, the Tintype was inexpensive, opening photography to an even wider audience and had one of the longest periods of popularity of any early type of photograph. They were very popular with Civil War soldiers because it was less likely to break than the fragile glass Ambrotype or delicate silver-coated copper Daguerreotype. They could also be slipped into an envelope and sent through the mail. In 1863, tiny portraits seven-eights by one inch (about the size of a small postage stamp) debuted with the invention of the Wing Multiplying Camera. They were popularized under the trade name "Little Gems" and Gem Galleries flourished until about 1890, when the introduction of the family commercial camera made it no longer necessary to visit a studio that specialized in the tiny likenesses or card photographs. The Gem image brought the price for a photograph to an all time low. Most photographers were required to offer a versatile range of services, products and image types in order to stay in business. Gem portraits were stored in special albums that held one image per page. Larger albums were made that held several of the small images per page, perhaps holding as many as a hundred portraits in one album. Gems were cut to fit lockets, cufflinks, tiepins, rings and even garter clasps. As with those of us today wishing to stay in business, photographers had to become creative and offer unique and varied products to support their studios. Several types of Tintypes were popular throughout their life. The earliest ones are stamped "Neff's Melainotype Pat 19 Feb 56" along one edge. The black iron support is of a heavier weight than later Tintypes which are about 0.017 of an inch. Tintypes of the Civil War period (1861-1865) are primarily sized one-sixth and one-fourth plate. Often, Civil War era images are datable by the Potter's Patent paper folders in which they were placed. These folders, introduced during that period, were adorned with patriotic stars and emblems. After 1863, the paper holders were embossed with their designs rather than printed. A tax on all photographs sold in the United States from 1 September 1864 to 1 Aug 1866 required the application of a revenue stamp. Continuous photographers canceled the stamp by writing their initials and the day's date on the face of the stamp. The canceled tax stamps may be found adhered to the back of an image case or an uncased Tintype. I have yet to find one of these stamps, but, boy, am I still looking!! Brown or chocolate Tintype images had a brief period of popularity from 1870 to 1885. In 1870, the Phenix Plate Co. began making plates with a chocolate-tinted surface. It was said in a period journal that these specialty Tintypes, "created a sensation among the photographers throughout the country, and the pictures made on the chocolate-tinted surface soon became the rage". In the 1870s, the "rustic" theme also made its debut in studio photography offering painted backgrounds, fake stones, wood fences and rural props. Chairs and tables were made of whole or cut logs, floor rugs and table drapes were of animal hides and the log cabin look became popularized. It wasn't uncommon to see entire furniture or props made of steer horn. Lovely, eh! Tintypes saw limited success in Europe, but were commonplace in American homes for decades. From 1875 to 1930 photographers continued the Tintype business in what is known as the Carnival Period in the Twentieth Century. These itinerant Tintypists set up studio tents at public gatherings, such as fairs and carnivals. They came equipped with painted backdrops of Niagara Falls, the beach, boats and other novelty props for comic portraits. Other Tintype galleries operated on the popular boardwalks at beach resorts. Early Tintypes were placed in the leather or plastic (thermomolded) cases which had been used for Daguerreotypes and Ambrotypes. Some Tintypes were delivered loose in just the gilt frames to reduce costs or, as the Tintype customer demanded lower prices, the cases were dropped altogether in favor of paper folders. Now, instead of a glass cover, the Tintype image was given a quick coat of Japan Black Lacquer (varnish) to protect the image and any applied tints of colour and slipped into a paper folder with a mat opening to view the photograph. These paper mats did not fare well over time and very few of them remain with their accompanied Tintype, either being discarded by their owner or disintegrating throughout the years. The Tintype held on for so long because it was the only type of instant photography available or the time. Itinerant Tintype photographers worked the back roads and county fairs and the process appealed to the street photographer who was able to set up business without much capital and very little time needed to produce the final product for the customer. The average price, from the inception of the Tintype process, in 1856, until its fadeout in the 1930's, was ten to twenty-five cents for an image about the size of a playing card. Smaller Tintypes sold for a penny or less, making photography universally available to the working class as photographers spread out over the countryside. Tintypes frequently were carelessly trimmed when separating the individual images from the whole plate. This is partly because the case or envelope would cover the edges of the image and care was not necessary. They usually had their corners clipped either to prevent sharp edges from tearing the paper folders, injuring the client or to indicate in which direction the plate would be loaded into the camera in the darkroom. Very often the tintype image was tinted, giving it a more lifelike quality than the monochrome image could offer. Tints were added to cheeks and lips and jewelry and buttons were often accented with gold leaf paint. People were still not ready to accept a photograph for what it was and wanted it to have colour and imitate a painting. Many miniature painters left their dying portrait trade to become photographic colorists as the photography industry grew. Compared with other photographic processes of the time, the Tintype tones seem, to some, flat and uninteresting. I don't agree with this claim as I find the detail and depth of field of properly exposed Tintypes absolutely superb and captivating. So, all these details about Tintypes and so far, no story! I know what you are thinking, get on with the good stuff. Well, one of the things I most enjoy is scouring yard sales, thrift shops and antique marts for troves of treasures that are missed by others but become absolutely priceless additions to my collections. While everyone else is pondering the price of beds, tables and dishware, I am digging through dusty books, cluttered boxes and peering through the lower shelves of glass cases for that one item stashed away from prominent sight and possible sale. I mostly look for photographs and postcards that display rare locations, unusual subject matter, fantastic clothing, wonderful backgrounds and props or a single photographic process with which I can educate and teach. Such was the mission the day I stumbled upon a the offerings of a local second hand shop. The dealer obviously traded in photographic imagery but, much to my dismay, had little regard for the history and importance of the pieces to which he had laid claim. There, before me, strewn across a dirty table were stacks of velvet photograph albums stripped bare of their contents and tagged with outrageously overpriced sales tickets. Boxes and boxes of carelessly packed photographs were all around the shelves marked by size from twenty-five cents to one dollar each. Clearly, the dealer put more emphasis on the empty, worn albums than he did on the individuals who images shared that enclosure. An immediate look through the first of the images clearly indicated that the faces in all these photographs shared their lives in some aspect or another. The photographer's marks, studio names, towns and cities put all these people in the same places and photographed by the same photographers. It broke my heart to think that by stripping these albums of their contents, the dealer had separated connections and lives. I wanted to scoop up the entire collection, hold the images close to my heart and whisper, "It's ok, I'll keep you together forever". Alas, even at the modest prices posted I would be unable to afford to rescue this forgotten history in its entirety. This was no ordinary Tintype. Not only was it inside the collector's dream of the pale pink and gold embossed paper folder but, it was a brown Tintype. Be still my heart! I had never spied a brown tintype until that moment. Further still, the cheeks of this subject were toned in delicate pink and I certainly hoped the photographer had first positioned a soft cushion on that rustic log chair on which my prim and proper lady could sit. This image had all the earmarks of collectible history and she was definitely coming home with me. I was still reeling from the rarity of my find when I bent down and pulled a shabby box of photographs out from under a table half hidden by a ragged tablecloth. A few more images were drawn to my attention and I was just about to slide the box back into its hiding place when I caught my finger on something sharp at the bottom of the stack. Withdrawing the object I couldn't believe my eyes when, there, I beheld the duplicate image of my diminutive lady. Only the slightly bent corner on which I had caught my finger and the scarring on the right hand side of the second Tintype could tell the twin photographs apart. What looked like a large pale scratch was actually caused by chemicals in the development process or a poor coating of the silver emulsion when the photographic plate was made. The two photographs were identical right down to the divided background paper and the edge of the table leg captured at the far left. The images had been cut and separated exactly through the middle of the repeated table detail. There were no more boxes of images through which to search and I was disheartened to admit that finding any more identical images would be impossible. The rarity of finding these two together in one place would have to be treasure enough for the day. So....photographers widely considered Tintypes cheap and artless, eh. Oh, I can't begin to believe that for one single moment. Regardless of what photographers felt of them at the time they are priceless recordings of wonderful images. Tintypes are truly significant in that they made photography available to working classes and not just to the more well-to-do. Up until the time of their invention, the taking of a portrait had been more of a special event but, from the introduction of tintypes onward, we see more photographs, of more people, in more relaxed, spontaneous poses. I went home from my shopping excursion sad that I was unable to rescue all the stacks of photographs I'd encountered that day and keep their lives together, but my discovery of a box without hinges or lid truly revealed a golden treasure I had found inside. There could have been as many as ten or fourteen more identical photographs produced the day my lady sat for her picture, but from here on, thanks to my discovery of the box, these two copies of her image will forever remain together. They are a treasure and will never be separated again. Since we have been discussing Tintypes, I couldn't resist the opportunity to post the one and only existing photographic Tintype of my family. 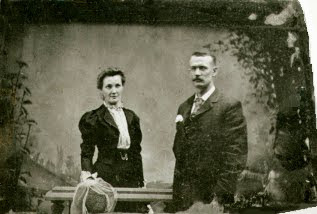 Behold, here are my Mother's Grandparents, Sarah Jane Sinclair and William Edward Stevenson who were married the 25th of December, 1895. These absolutely proper (and rather wealthy as their lives progressed) family members were first generation Canadian born and lived in and around the small towns and villages of Fingal and St. Thomas, Ontario, Canada on the Northern shore of Lake Erie. Notice how poorly the Tintype has been cut, an obvious indication of a photographer with less than perfection on his mind. The exposure is somewhat weak (as photography skills go) and the wrinkles in the background paper show obvious use in setup and dismantle. With all its imperfections, though, I simply love this photograph. Knowing what I do about these people and the process that created the image I can only smile and giggle. You see, all of the later family photographs from this branch are professionally taken by the highest standards of professional photography. In them, both Sarah Jane and William and each of their five children are dressed in their best, poses are upright and proud and each of the original photographs were framed and stored to archival standards so that they passed down undamaged through generations to my hands. Not one of the later photographs dared to have a single imperfection yet this one has many. I believe I know why. Remembering that Tintypes were most often reversals, notice that William wears a flower boutonniere on his right lapel. This, according to proper rules of etiquette, is on the wrong side of the jacket. This photograph is reversed. 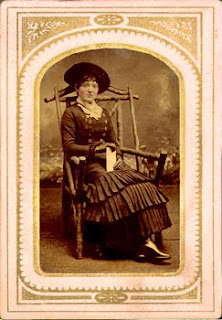 Sarah Jane is wearing an 1890's "Walking Suit" with waist length jacket, wide lapels and "Rag o Mutton" sleeves---large ballooned shoulders and tight arms. Her high, ruffled neck blouse with the ruffles and button down front goes with the outfit as if it were designed from a fashion plate of the that very day. William wears a plaid jacket (you probably can't see) and a wide silk tie with small shirt collar. He is current in the 1890's fashion as well. The place in which this family lived is along the lake shore and, to this day, there still remains a summer resort town with quaint shops along a boardwalk, tourist attractions and.........photographers. Knowing that William and Sarah were married on Christmas Day 1895, it isn't much of a stretch of the imagination to believe that this very photograph was either taken as their wedding photograph or taken, perhaps, the following summer down by the lake shore. As time passed, and William's income and standing in the community grew, I can only imagine how he might insist that all future photographs of himself and his family be absolutely perfect and of the best quality. As for a young man and woman just starting out in 1895, a quick and inexpensive Tintype by the lake is as good as it gets. Don't worry Granddad William, it just doesn't get any better than this for me.